It seemed like a dream. Roseanne was coming back. Sure, in this time of rampant nostalgia it wasn't surprising but it was still a welcome surprise. Then to have it come back and be not just good, but really good, was like getting a chance to have the ultimate do-over. Then, just as quickly as it had come back, it was gone. Canceled. The casualty of a disgusting tweet written by the the very person who (seemed) to make the show possible. This was accepted but left such a bitter taste that rumblings of a spin-off quickly caught fire. In no time it seemed like The Conners was a living breathing entity. With the main cast of John Goodman (Dan Conner), Laurie Metcalf (Aunt Jackie), Sara Gilbert (Darlene Conner), Lecy Goranson (Becky Conner) and Michael Fishman (D.J. Conner) also on board, all other information about this show has gone dark. Big questions loom such as what will The Conners be like? And, obviously, how will it carry on without Roseanne? When the show originally aired from 1988 to 1997, it was sort of seen as something great that ultimately jumped the shark (does anybody even say that anymore?). Sure, the first 5 or so seasons were incredible. As Roseanne continued it waned and almost became unrecognizable. There were avant-garde episodes. The lottery episodes (or, season if you want to call it that). And just a host of misplaced ideas that all seemed determined to soil the show we had all loved and lived with. I'm all for a show spreading its wings. Roseanne seemed bent on flying away. Now, the majority of this abomination took place in the last season of that first incarnation but the damage had been done. The 2018 version of Roseanne seemed destined to right that wrong. And it did. Okay, it wasn't perfect but, like the show's previous incarnation, it spoke to deeper truths about the human condition. It was confusing in a confusing time but Roseanne offered hope. A light at the end of the tunnel saying no matter who you are, no matter what you are, everything is going to be okay. Sure, Roseanne Barr being a supporter of Donald Trump didn't make sense. The character of Roseanne Conner supporting him did. None of that mattered because Roseanne was never about one dominant ideology. It was about people and their differences naturally receded into the background. Roseanne's tweet wasn't indicative of any political movement. Rather it just showed really poor judgement, short-sightedness and awful taste. It was Roseanne Barr being mean, impulsive, and racially insensitive. Roseanne Conner had nothing to do with it. How will The Conners work without Roseanne? This show wasn't called "Roseanne and the Conners." It wasn't called "Domestic Goddess." It was called Roseanne because, regardless of where it may have gone, what characters it chose to follow, it always came back to her. Roseanne Conner was the matriarch. The glue that held this family together amidst fights and other trying times. It's why whenever Roseanne wasn't on an episode for any length of time, the show seemed to feel all over the place. Often, that was by design. She would usually come on at the end and solve problems or show people their problems weren't really that bad. The Conners isn't going to have that. So who is going to stand in the lofty shoes of this iconic character? Dan? Darlene? Becky? Or, might The Conners focus on a collectivist approach? Could we see the characters dealing with their issues as a family? Might this create more problems between them? Might the aforementioned characters not be up to the task at hand? We will see but the fundamental question remains: Can the Conners carry on without Roseanne? They can. But whether that's a good idea remains to be seen. How will Roseanne Conner make her exit? There's a mini-movement happening in films whereby the past is forgotten. We are seeing it with the Halloween franchise and The Terminator franchise. There new incarnations are picking up as if the subsequent sequels never existed. And in the case of certain movies (where a star was shown to have been egregious in their off screen actions), an actors performance has been scrubbed entirely. That luxury can't be afforded The Conners. Quite simply, this is something they are going to have to deal with. It might take one episode. Heck, it might take the entire season. The Conners is going to have to deal with Roseanne not being around anymore. Maybe they'll never stop dealing with it? This doesn't mean that all is lost. If they can keep everything within the fictional realm of this show, that will bode well for The Conners. I personally think that killing off the character of Roseanne isn't the way they should go. In fact, contractually they may not be able to go that way. (This will be discussed more in the next section). So how else might we get The Conners without Roseanne? Maybe she leaves Dan? Perhaps Dan and Roseanne move away (to a warmer climate), and the first season of The Conners shows us Dan in Lanford? He could be alone he ties up their affairs? Something tells me that the ultimate way they do this will be handled correctly. Even if I have no idea how they are going to pull it off. The people involved with The Conners know and understand Roseanne. They wouldn't have greenlit this show if they didn't have this fundamental question figured out. Time will obviously tell if there's was the right decision. Theoretically, the character of Roseanne could return. Maybe not to The Conners, thus making that show Roseanne 3.0, but it isn't out of the realm of possibility that Roseanne Barr could play that character on her own show or an entirely different show. Heck, she may not even have to be the main character! Look, if Mel Gibson can successfully come back after what he did, then it stands to reason that Roseanne Barr could as well. Honestly, the things that seem to put an actor or actress in filmmaking jail forever are of a sexual nature. That's how it is right now. There's no telling if 5 years from now some of those players who are currently persona-non-grata, might ultimately make their way back to the big or small screens (or both). It was written by The Hollywood Reporter that Roseanne Barr currently holds the rights to that character. It was also said that any spin-offs or reboots also fall under her control. So, the character of Roseanne Conner appearing elsewhere could happen at some point. Who knows? Maybe times will change? 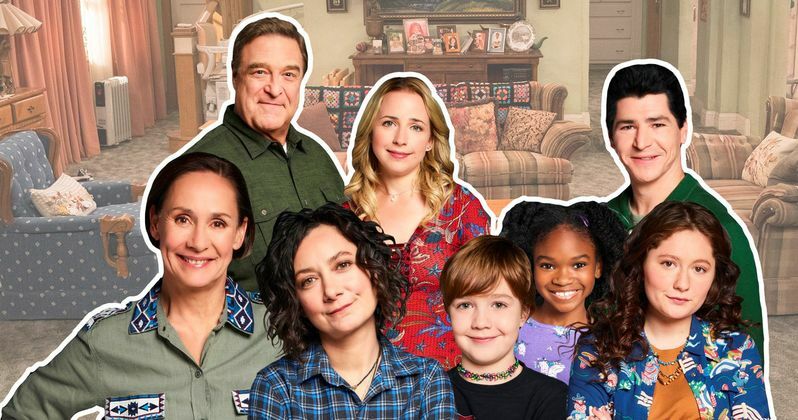 There could be an outpouring of good will, Roseanne Barr will appear contrite enough, and her character could exist within the same shared universe as The Conners? In fact, depending on how The Conners does, Roseanne could eventually return to Roseanne, and, like they did with the last season of the first incarnation of this show, they could act like The Conners never happened. Knowing Roseanne she would probably poke fun at not being on that show. The issue might be if she took to social media again and poked fun at WHY she wasn't on it. So to finally answer the question, yes, of course she COULD come back. The question is when and how? The when probably wouldn't be for a long time. She'd have to show genuine contrition and right now it doesn't seem she's done that. How could she be Roseanne again? Well, lets just leave that up to the creative folks to figure out. Will Dan have a love interest? This isn't entire out of the realm of possibility. Dan did in fact have an affair on Roseanne in the first incarnation of the show. This was revealed during Season 9. The only issue with bringing the person Dan cheated with into The Conners, is that the latest incarnation of Roseanne made it pretty apparent that much (but not ALL) of Season 9 didn't actually happen. Afterall, if it did, Dan couldn't have been on the new incarnation could he? He did die in Season 9, right? Perhaps another infidelity is how Roseanne leaves the show thus making The Conners... The Conners? Or, maybe The Conners takes place in some realm like The Sixth Sense where Dan is dead and lives among his family? Perhaps his apparition drove Roseanne crazy and that's why she isn't around any longer? Alright, I realize I am getting off track here, but you can see how story lines can get confused, right? So... I am willing to wager that we see Dan, in his grief, at least attempting to date. With social media and dating sites being what they are, I have a feeling a whole episode will be devoted to getting the Dan that is single... ready to mingle. Then, and this is kinda far flung (but not really)... perhaps he and Aunt Jackie might hook up? Okay, I know this is blasphemous and it's going to piss some people off. However, there was that one episode ("An Officer and a Gentlemen" in Season Two) where Dan and Jackie did admit to noticing each other. Roseanne Barr wasn't in much of the episode (she had problems with the script), so she was basically written out of it. The proceedings then became the Dan and Jackie show. They had genuine chemistry and both seemed touched that the other thought of them in a different way. Nothing ever came of this. The moment was innocent and special. Do I think Dan is going to marry Aunt Jackie? No. I think it might be touched upon. Ultimately, I think Jackie will help set Dan up to deal with life without his Rosey. With an October debut, could episode #1 continue the Roseanne Halloween tradition? We all know that the Conner's is going to premiere on October 16. What better way to establish goodwill, to bring in viewers, to make everybody smile and breathe a collective sigh of relief than to start with a Halloween episode? Everybody loves the Roseanne Halloween episodes. In fact, despite her awful actions, I have a feeling that some of those older episodes are going to be playing somewhere on Halloween. Why? Because those Halloween episodes are bigger than Roseanne. Most people celebrate Halloween. Most people love that time of year. There's a coziness to it. A tradition. The Halloween episodes from Roseanne represent ALL of that. They crossed all lines of race and class. We all wanted our Halloween celebrations to be as rich and fun as the ones had by The Conner Household. So, is it out of the realm of possibility, considering what happened to with the last incarnation of Roseanne, that the newest incarnation might start with a softball Halloween episode on The Conners? It would be fun and fairly easy to put off. Also, it might make the first show without Roseanne Barr easier. There would be natural moments where they could deal with her absence. Maybe they touch upon the first Halloween without Roseanne? Maybe Dan and D.J. aren't feeling it that year because she's gone? Perhaps, Halloween could be used to heal The Conner family in a way that that holiday never has utilized before? What will The Conners politics be? Or did that ever matter? One thing I think we can all agree on in these divided political times that Roseanne wasn't like any show we had ever seen. It was political. It was funny. It was real and at the same time it was entertaining. And, in the most recent incarnation, more than at any other time in the show's history, it had something for everybody. A Republican and Democrat could watch the show and laugh. However, they might be laughing for two totally different reasons. That was this brilliance of this show. Roseanne was the show we needed at the right time. The character of Roseanne Conner was a Republican. Her sister Jackie was a Democrat. They were at odds because of this from the first episode. However, unlike most of the country, they said lets get over that, and realized that we're all in this together and we need to start acting like it. Obviously, as the show went on, politics kind of receded into the background. They were still there, though. Always close to the surface and ready to help deepen these characters. Will The Conners continue to straddle this line showing the ineptness of all the political parties? Or, will it veer a bit more left considering that the outspoken, Trump-supporting star of the show is no longer there? Again, Roseanne Barr's actions that had her removed from the show aren't indicative of any political group. Her actions are her own and she has to live with them. Now, we have to live with The Conners. Here's hoping it can transcend all the political hoopla and give us what we really want, a show that is as entertaining as it is rich with characters that represent us. If The Conners focuses on that, no matter what your politics are, we all win.